Do you know about Janus? He is the two-faced Roman god of beginnings and endings, transitions and passages, always looking at both the past and the future. Today is a good time to remember Janus because we are at the end of one year and the beginning of another. 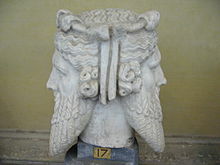 At midnight we transition to the month of January, which is named for Janus. So, ever since I learned about Janus, I remember him at this time of year and do a little looking backward and looking forward of my own. Actually, you don’t even have to know about Janus to do that on New Year’s Eve – I bet you might even have been reminiscing and planning ahead already. 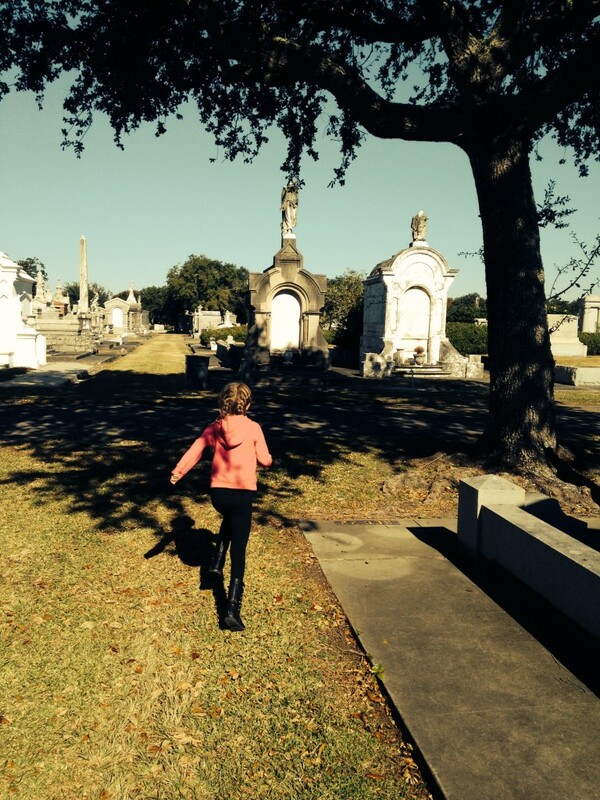 One thing I had not done in many years is visit the family tomb, which is, I guess, the ultimate “look back.” If you have never been to a New Orleans graveyard, I recommend it. They are strange and beautiful, as full of character as you would expect in this eccentric city. Because New Orleans is below sea level and has a tendency to flood, all the graves are above ground in what look like small stone houses. The graveyards themselves have the feel of a city of diminutive, ornately carved dwellings. Some of them have what looks like a front walk and steps going up to an entrance – but that entrance is usually an alcove engraved with the names and dates of each family member now residing in the tomb. 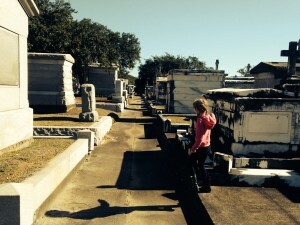 Usually, I go to cemetaries by myself or with another adult and it is a meditative experience. 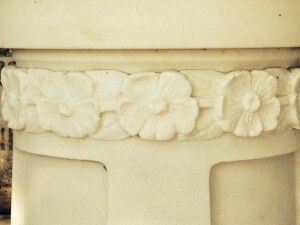 But this time I took my 7 year-old daughter, wondering what she’d think of this place dedicated to remembering the dead. After all, like a lot of kids her age she’s fascinated with zombies and ghosts. It turns out that what she saw when she arrived was a great place to climb, run, and jump. At one point I had her run beside the car just to get some of her energy out! Looking backward and looking forward, I saw my lively girl dancing amidst the memories of her great-grandparents and aunts and uncles. Their lives led to her life, their stories are part of her story, their futures are her past, and her future stretches beyond what they imagined. By the time she knows people buried in these tombs and worries about her own mortality, there will be another child bouncing ahead through life, climbing the stone walls and jumping off the ledges. I hope she’ll be able to look forward a little as she looks back at her past. I’m going to try to remember Janus as the year presses on and not just when toasting the new year at midnight. When you look both ways – consider both the past and the future – you don’t get too mired in memory or swept up in planning. Looking both ways gives balance and perspective, it can keep you from feeling trapped by old patterns or show you a reliable path when you feel overwhelmed by new pressures. Looking both ways brings energy to the past and beauty to the future. After my trip to the cemetery, looking both ways gives me hope that someday my descendants will run towards their own futures carrying with them their own yesterdays and the stories of their quirky ancestors. Cheers to last year and next year! Be sure to look both ways before you cross.